Toronto Dogs Directory: Ontario Veterinary College Receives Report On Risk Of Dog Importation In 2014 - "The Tip Of The Iceberg"
Ontario Veterinary College Receives Report On Risk Of Dog Importation In 2014 - "The Tip Of The Iceberg"
Last year, our group invested many hours compiling statistics on the little-known and rapidly growing trend of importing dogs from other countries to Canada. Along with a dramatic and steady increase in new 'foreign rescue organizations', many SPCAs and Humane Societies, seeing a drop in shelter admissions, have joined in the frenzy and are now reaching out to rescue animals outside of Canada while Canadian dogs and cats continue to perish in Northern Communities and in Canadian shelters in other provinces. We've also noticed another disturbing trend - rescuers and individuals are knowingly and successfully importing sick dogs into Canada, crowdfunding to 'cure them' and then educating others in how to 'beat the system' with unscrupulous methods aimed at exploiting the existing laxity in CFIA requirements. A few months ago, in the interest of our public health and the wellness of our own pets, we issued a call to action for this to stop. Unfortunately, it appears that hardly anyone is listening since very little has changed. In fact, foreign importation is on the rise. communities safe. So, for example, when we have sick dogs in Northern communities, any money spent trying to improve the health and welfare of those animals is part of a holistic, multi-agency solution to improve the public health and safety of those communities and, in turn, all Canadians. When citizens responsibly bring in a dog or two from outside of Canada, we can view it as an act of compassion: something out of the ordinary that, as a society, we may deem an acceptable and of minimal risk to the infrastructure we pay to keep in place. However, the torrent of importation originating from parts of the world with enzootic diseases that haven't been reported in Canada (until now) - all under the activist banner 'save them all' - puts a tremendous strain on that infrastructure . (That's why it is always better to operate in the country of origin and offer help locally rather than bringing the animals here en masse). And where does the responsibility fall when the importers abdicate their duty to those animals? It falls to provincial public health agencies, animal services, SPCAs and HSs. It is a fiscal burden to us all as taxpayers. 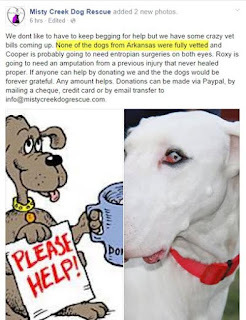 It is a burden to donors whose money is being used to help dogs brought in under less-than-transparent circumstances while those in our own communities go unassisted. How can we justify this to them? One wonders how people would react if the same laxity in legislation existed for agricultural livestock. Imagine someone on vacation somewhere 'falling in love' with a beautiful baby calf that was being neglected. They would make arrangements to have a local vet do a cursory exam and give the animal a 'clean bill of health'. The calf would then be transported to Canada and subsequently spreads Brucellosis or BSE through Canadian herds or enters our food system. Imagine the outcry when the food supply, livelihoods and our health are put at risk because of one person's bleeding heart? Of course this could never happen with the current system because the importation of agricultural livestock is far more heavily regulated than companion animals -- precisely because of the real dangers mentioned above. 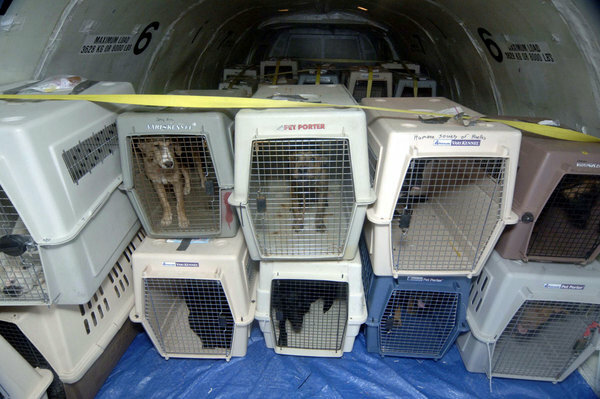 Australian authorities recently took this threat very seriously in how they chose to deal with a celebrity importing his two dogs on a private plane, despite very strict regulations and protocols . Australia has a sad history of threats to their native biodiversity from imported animals some leading to endangerment, extirpation and extinction . Isn't it remotely possible that the laxity at our own borders could allow the introduction of infectious diseases that may not only harm our companion animals and our human population, but endanger wildlife as well? Why isn't Canada taking the same action against foreign rescues? Are we less concerned about protecting our animals and people? Another, less obvious consequence of poor importation practices is being witnessed in some communities where rescues are importing dogs without any temperament testing or, in some cases, misrepresenting and obfuscating known behavioural issues to adoptive homes. Aggressive dogs are being placed with unsuspecting fosters and adoptive homes only to be returned to the rescue, surrendered to a shelter or, in the worst case scenario, euthanized because of harm to a family member. Who takes responsibility in such cases? Where does the fiscal, legal and, most importantly, ethical obligation lie? Once again, the Canadian public bears the burden - our healthcare system treats the injuries, our public health department deals with the increase in dog bites, our SPCAs and HSs euthanize the dogs and Canada takes another black eye to their already-tarnished animal welfare reputation. various locations in the USA to Calgary created a social media frenzy . The project, entitled 'When Pitties Fly', purports to be set to transport 200 of these dogs to Calgary over the next year. This comes on the heels of a recent resurgence of discussions in the media favouring the reinstatement of Breed-Specific-Legislation which would seek to ban the breed entirely. Fortunately, the ABVMA along with several other agencies have provided position statements on this, and in this case, made the very real connection to foreign rescue . allotted, they recorded a stunning total of 6222 imported dogs. This figure included only a few Canadian rescue organizations. It did not include humane societies nor individuals importing rescued dogs. As a result, it isn’t a stretch to project that over 10,000 dogs were imported to Canada last year. Currently, from the data for the first four months of this year we can conservatively project an increase of more than 50% over last year's totals. With the CFHS reporting that shelters are reporting a decrease in intake, many of these organizations are turning to foreign rescue to justify staying open. When questioned about why they aren't reaching out to help Northern Dogs or rescues from other provinces (like Quebec) who are in desperate need of help, many of the SPCAs, shelters and HSs who have partnered with foreign rescues state the cost of transport and logistics to be the main factors for turning to importing instead. In fact, the transport and whatever minimal vetting that has been done is often fully paid for by the originating rescue in the country of origin. All that remains is for the SPCA or HS to find them a Canadian home. The fact that we have long had import rescuers, who have met and often exceeded CFIA requirements, is the only reason we haven’t seen an outbreak of something dreadful in the past. But that's changing now. What will happen when we reach tens of thousands of dogs being imported to Canada?